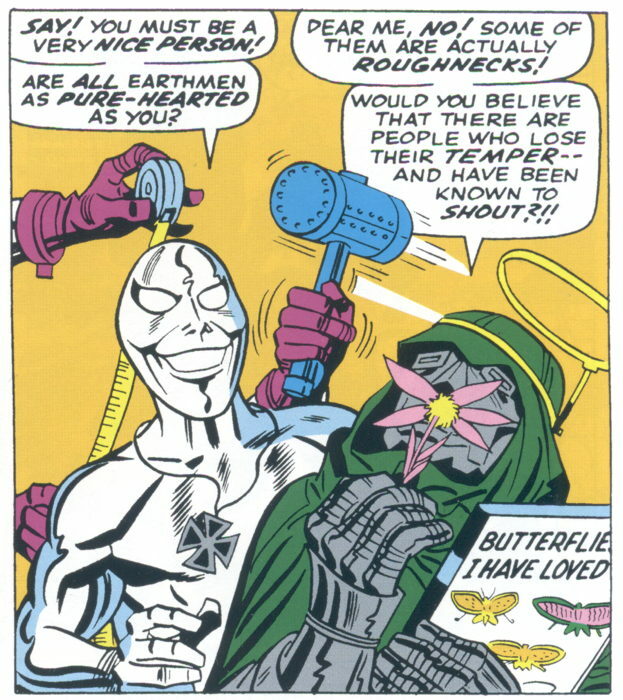 Why isn’t “Smile…Doctor Doom Loves You” still in print? “Any room,” you say? I say every room! Redecorate the interior of your house solely with mighty Marvel banners! I remember seeing these banners around the old shop back when I was but a mere customr, and then eventually selling the last two or three still languishing about the backroom when I was doing the eBay thing for that same shop a couple of decades later. The one I remember specifically is that Alpha Flight pennant. I bet that Spider-Man one will still sell great today. …Sure, it’s a little more common knowledge nowadays who the “X-Men” are* but I can only imagine how the mundanes reacted to the whole “Mutant Maniac” thing. …By the way, do people still refer to non-nerdy folk as “mundanes” or is everybody too infected with nerdiness now to be separated out? Gobble gobble one of us, and all that. When discussing these on the Twitters pal Andrew noted that his younger brother still had a “Follow Me to the Secret Wars” bumper sticker on this car. As I said to Andrew, given its current non-awareness by the general public, I can imagine the uninitiated seeing that and thinking it’s some kind of political statement or somesuch. Or, like, some conspiracy-minded talk radio thing. It can serve multiple purposes! Yeah, that Alpha Flight pennant is amazing. 10-year-old me would have lost his mind if he’d seen it. And agreed to do extra chores to afford it. Your “X-Rated” anecdote reminds me of the time I was at the library in the “Graphic Novels” section to obtain funnybooks and a local busybody was grilling the librarian. – Not X-rated. But definitely OVER-rated! – No, “graphic” as in “graphite”, because it annoys inkers and colorists to praise the pencillers.